My dear dance family: There has been a breach of trust in the Tribal Bellydance community and various official statements are currently being published and circulated. For my part, I will continue to stand for Justice, Respect, and Honesty. I am *strongly* opposed to victim blaming, body shaming, and secret ridicule. If anyone wants to speak about any of these issues or needs access to the various public statements, I can provide those. My focus is on promoting safe dance spaces, respect for personal modesty choices, and celebration of accessibility to dance. If you EVER see a dancer being ridiculed, objectified, or shamed for ANY reason, I hope that you will help stand up against abusive behavior. Or if you need an ally who can stand with you or advocate for you, I would like to be someone you can trust to help you and support you. 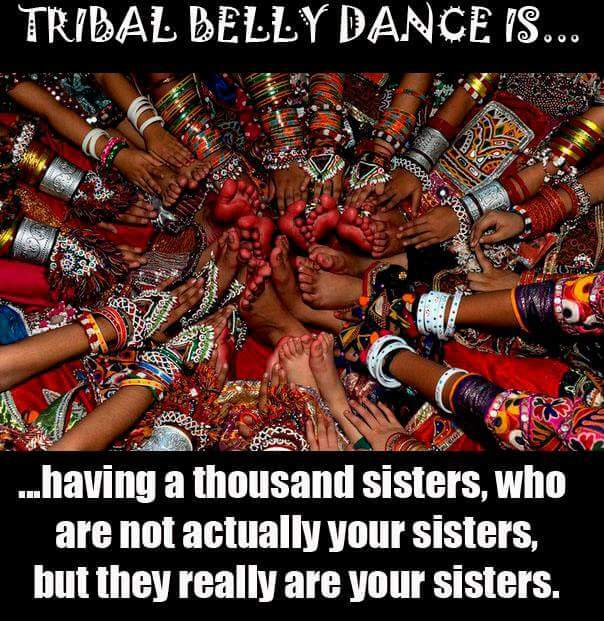 …having a thousand sisters who are not actually your sisters, but they really are your sisters.